Upon entering the office, we have some brief “paperfun” or a computer kiosk for you to use to tell us about youself and all the details about why you are here today. The “paperfun” provides us with general information about yourself and your condition. If you are not familiar with touch screen computers, our staff will assist you with everything you need to fill out. Once the “paperfun” has been completed, either by hand or on the computer, you will have a complimentary consultation with the doctor to discuss your health-related problems, concerns, as well as potential and /or available treatment options. In order to determine what your actual problem is, the doctor will ask you various questions related to your condition. Next, a number of specialized tests will be performed to determine which tissues are affected and to what extent. This examination process may also include some high tech studies called sEMG tests or Surface Electronic Myleogragh studies. Much like how an EKG measures the condition of your heart muscle, this will measure the activity in your muscles at injured areas and give the doctor and staff a clearer picture of how encompassing your problems are. Your specific condition may require us to make some x-rays to either rule out more serious conditions or assist us in developing the most effective treatment plan for you. Our diagnostic picutres of your spine and body are read by Dr. Terry Yochum, author of “Essentials of Skeletal Radiology” and one of the world’s leading experts in Radiology at the Colorado Radiological Center, in Arvada. You will be provided with a written copy of your radiology report for you to keep with your medical records at home. Once finished with the examination and all appropriate diagnostic studies, patients will generally be provided with their first treatment during this same visit. 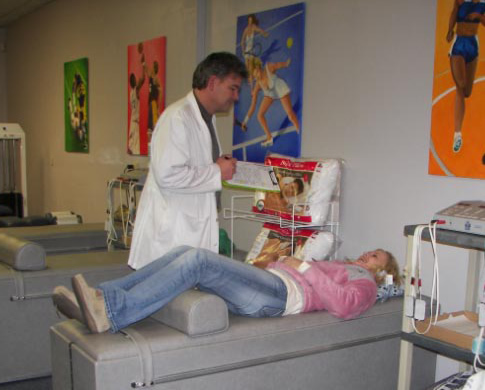 This may include specific spinal adjustments, physical therapies, and/or soft tissue therapies. You will be given a convenient appointment time for your follow-up visit. Generally speaking, patients are seen within 1-2 days and are provided with a complete written report of findings. If you are married, your spouse or partner is always welcome to attend and ask questions. Treatment options for your condition will also be discussed during this time.